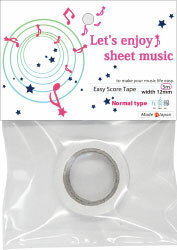 The 'GORAKUSEN' (easy score tape) was developed in June 2009 by Naoko Horiguchi. I have seen many times that my fellow musicians or music students make a mess when they write notes or try to correct on their score. For example when they change the cadenza that their teacher advised, or write a variation, or add notes for page-turns. "I want to write notes on my score more easily!!" I really know the trouble that everyone has with writing notes because I was also a piano student at conservatorium. 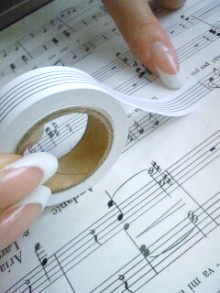 So I thought about how I could help musicians and came up with the design of a scored adhesive tape: GORAKUSEN. 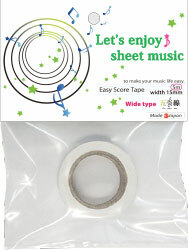 This is the concept behind Aria Co.
GORAKUSEN (easy score tape) ,It is my solution to help musicians. In Japan, already 80,000 GORAKUSEN have been sold. 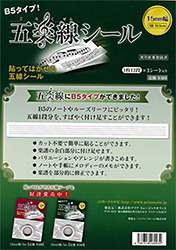 Now I want to help musicians who live outside Japan. 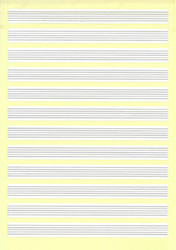 ☆Sales site☆　Sending out from Germany "Oboe-Shop"
☆Wanted☆ We are looking for a new dealer. 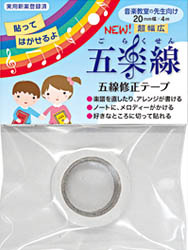 ☆Sales site☆ Australia "The Sydney String Centre"
☆We will send by registered mail. 2005-2017 Copyright Aria Music Office.